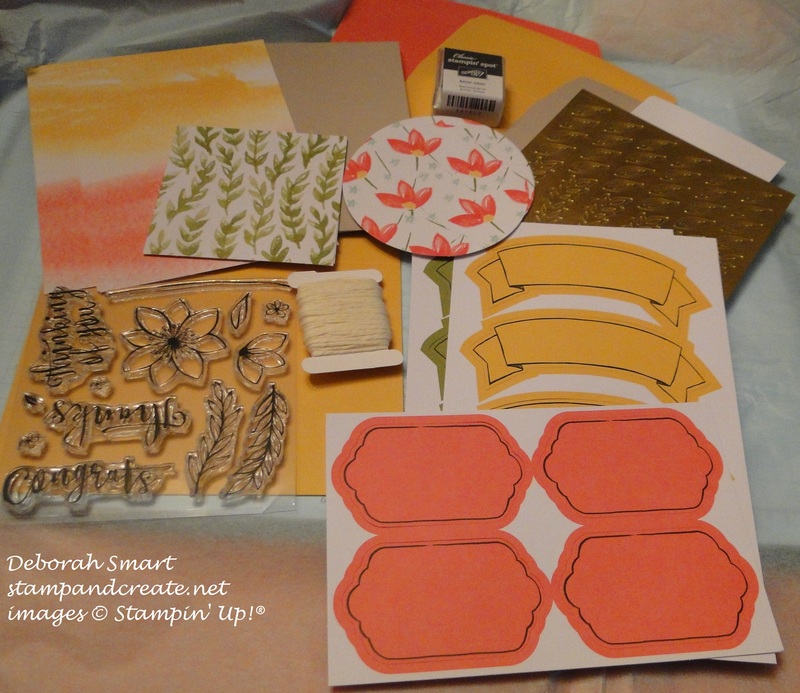 You may remember me posting over the last few weeks letting you know that Stampin’ Up! 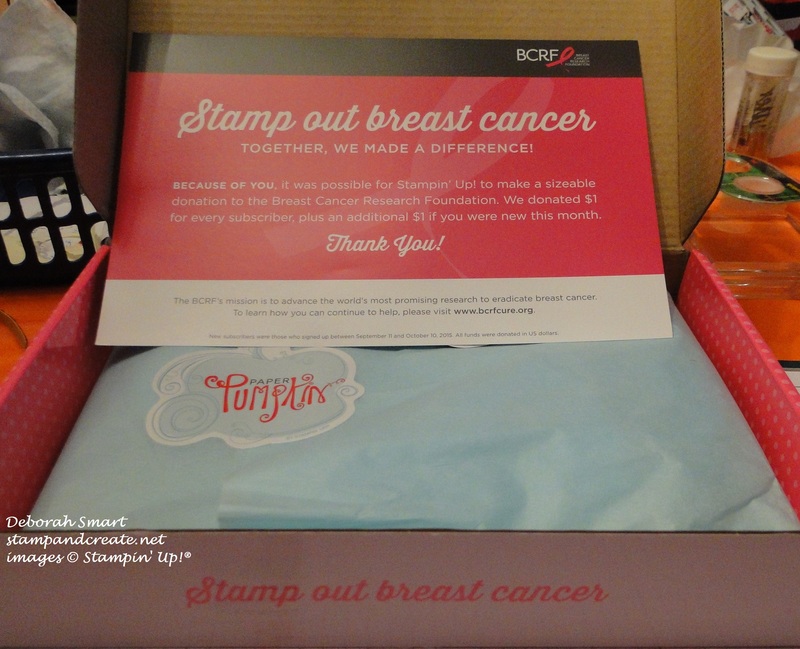 had committed to donate to the Breast Cancer Research Foundation (BCRF) – $1 for each October Paper Pumpkin shipped, with an extra $1 for new subscribers in October. Well, I received my wonderful PINK box on Friday!! I finally had some time to play today & thought I’d share this kit with you. It makes 3 different sized cards; a regular greeting card, one a bit smaller, and one that could be a gift tag, or just when you need ‘a little something’ for someone. Aren’t these great?! I made them up exactly as the kit instructed, so that you could see how they were intended to look. When I have some more time, I’m going to play around with mixing things up a bit! This first card, the full-sized one, comes with the card base and the pre-done watercoloured paper. You stamp the images onto the watercoloured paper anyway you want, then add the gold accents, the baker’s twine and the sentiment banner. 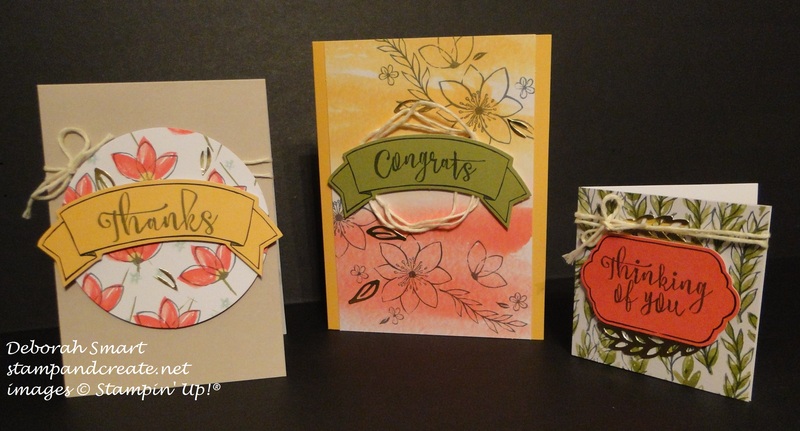 This next card is a bit smaller; again you start with the card base, then overstamp the flower outline using the Basic Grey ink spot that comes in the kit onto the Designer Paper die cut. 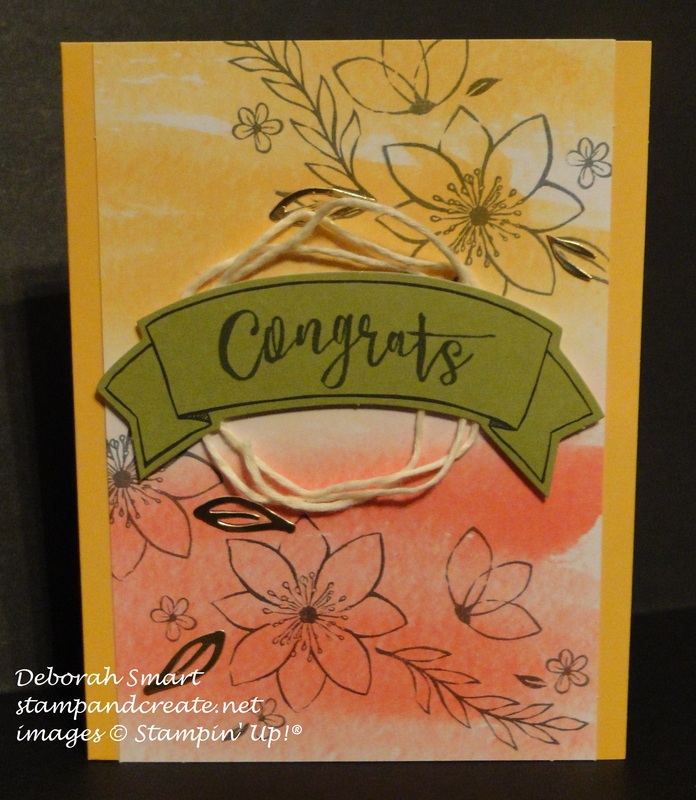 Then you wrap the card base with the included baker’s twine, add the gold accents, and add it all to the card base using the included Stampin’ Dimensionals. The 3rd card in the kit is a 3″ x 3″ card; you again overstamp the leaf images, add the gold accents and sentiment, wrap with the baker’s twine and attach it to the card base. What I really love about my monthly Paper Pumpkin is the exclusive stamp set that comes in each kit, plus the exclusive Ink Spot! You can’t buy either of these in any other catalogue, yet you can use them over & over again. Plus, there are always lots of product left over that I can use to make other cards and projects. If you haven’t subscribed to get your monthly creative escape, delivered directly to your door, you should! You can order by clicking HERE, filling out your personal information, and your own Paper Pumpkin will arrive at your door around the 20th of next month! Previous Previous post: WOW!! 15% OFF STAMPS! Next Next post: 15% OFF STAMPS – STARTS NOW!